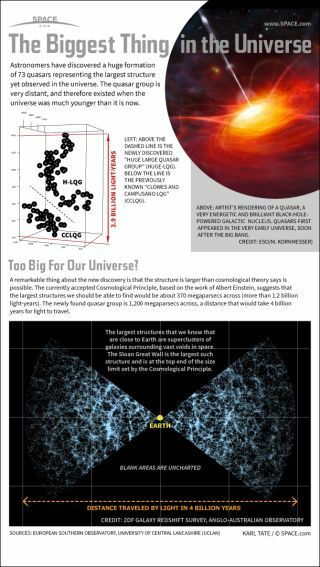 Scientists say an enormous cluster of quasars in the distant universe is larger than should be possible. Astronomers have discovered a huge formation of 73 quasars representing the largest structure yet observed in the universe. The quasar group is very distant, and therefore existed when the universe was much younger than it is now. A quasar is a very energetic black-hole-powered galactic nucleus. Quasars first appeared in the very early universe, soon after the Big Bang. The light from a quasar is so intense that it can be visible from across the universe. The currently accepted Cosmological Principle, based on the work of Albert Einstein, suggests that the largest structures we should be able to find would be about 370 megaparsecs across (more than 1.2 billion light-years). The newly found quasar group is 1,200 megaparsecs across, a distance that would take four billion years to cross at the speed of light. The largest structures that we know that are close to Earth are super clusters of galaxies surrounding vast voids in space. The Sloan Great Wall is the largest such structure and is at the top end of the size limit set by the Cosmological Principle.